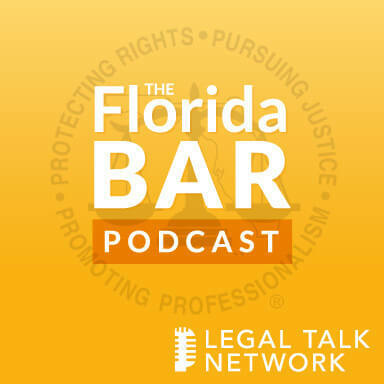 Christine Bilbrey: Hello and welcome to The Florida Bar Podcast, brought to you by LegalFuel: The Practice Resource Center of The Florida Bar on Legal Talk Network. We are so glad you are joining us. This is Christine Bilbrey. I am a Senior Practice Management Advisor at the Bar and one of the hosts for today’s show, which is being recorded from our offices in Tallahassee, Florida. Karla Eckardt: Hello. I am Karla Eckardt. I am a Practice Management Advisor at The Florida Bar and a co-host of today’s podcast. Our goal at The Practice Resource Center is to assist Florida attorneys with running the business side of their law practices. We focus on different topics each month and carry the theme through our website with related tips, videos and articles. Christine Bilbrey: So this month we are discussing the state of professionalism in the legal industry. This has been getting a lot of news and so we want to talk about the ways the Florida Bar is seeking to elevate the level of professionalism among its members, and joining us today are Rebecca Bandy and Adriannette Williams. Rebecca Bandy serves as the Director of The Florida Bar’s Henry Latimer Center for Professionalism. She joined the Bar as the Assistant Director in March of 2017. Rebecca earned her JD from the FSU College of Law and previously practiced as a family and criminal law attorney in Tallahassee. She most recently taught college level courses at a high school, where she established an award-winning mock trial team. And Adriannette Williams is the new Assistant Director of the Henry Latimer Center for Professionalism at the Bar. Adriannette has a civil litigation background as well as extensive experience in higher education and civic leadership. She received her JD from Western Michigan University Thomas Cooley School of Law and has a bachelor’s degree in Business Administration, a human resource certification and a master’s degree in Leadership Communications from the University of West Florida. Welcome to the show Rebecca and Adriannette. Rebecca J. Bandy: Thank you. Glad to be here. Christine Bilbrey: So Rebecca, let me start with you. Tell our listeners a little bit about yourself and the work that your department does here at the Bar. Rebecca J. Bandy: So I am excited to be at the Bar. I came on board as the Assistant Director for Professionalism two years ago and then last year took over as Director, and I am so excited about my job here. One of the things that I do is I get to go out and I get to meet lawyers from across the state as well as law students and I get to promote professionalism with them and it’s such an important topic. Professionalism and civility are expected of Florida attorneys, and our role here at the Bar and especially in the Center for Professionalism is to take that message to our law students, to our attorneys and let them know that we have very, very high standards in Florida and that they will be held accountable if they are not acting professionally and in a civil way. And Gallup Poll each year, we rank as a profession extremely low in measures of honesty and ethical standards. And so our goal is to improve the perception of lawyers and also make this a healthier and more balanced profession for people to work in daily. Christine Bilbrey: Thank you. So Adriannette, are there specific projects that you are handling within the Center for Professionalism? Adriannette Williams: Yes, there are. As a new hire, I — as every new hire we meet with our Executive Director, Mr. Josh Doyle, and what he charged our department with is being basically the liaison between the Florida Bar, attorneys, future attorneys and the public. We already had in place our Practicing with Professionalism Program and that’s for new attorneys who have been admitted to the Florida Bar, and we also have our Practice and Professionalism Enhancement Program, which is for attorneys who have gotten in trouble and go through this refresher program. So what we have been doing is almost a fill in between to educate our attorneys and to inform them so that they don’t end up on the other end, whether in that Enhancement Program or being disciplined. So over this past year and one month I have done over 18 presentations on different topics. We have ramped up our public outreach and we make it a point to talk about the hard topics, but we present them in a way that allows for maximum reception from our audience. This includes mental health and wellness, diversity, privilege, bias, balancing families and professionalism and the steps that you need to take while you are in law school to ensure that you become a professional. Christine Bilbrey: Great. So Rebecca, you touched on this a little bit, but I read on your website that back in 1986 the American Bar Association Commission on Professionalism published a report that stated that lawyers’ efforts to comply with the rules is still sharply on the rise, while lawyers’ professionalism may well be in steep decline. And although lawyers have increased the seriousness that they have about taking the rules seriously because they are afraid of being disciplined or of malpractice suits, they also have tended to look at nothing but the rules. So if conduct meets the minimum standard, lawyers tend to ignore encouragement to set the standards at a high level. Do you still think that that is the current climate in the legal industry or have you seen some change in lawyer attitudes? Rebecca J. Bandy: That’s a great question. It’s also a very complicated question. There was actually an article published just recently by Justice Kennedy of the Florida Supreme Court, and in that article he, to paraphrase him, addressed professionalism and civility and pointed out that we are a very combative profession by definition. Our whole profession is designed around conflict. And so there is always going to be some issues. There is always going to be people who don’t measure up, so to speak, from day-to-day. We are human. However, as a whole I think that people are really starting to understand that the Florida Bar is serious about professionalism. We are serious about these standards, the expectations are high and we are going to enforce those standards. And we do so in a number of different ways. Karla Eckardt: So the Florida Bar Center for Professionalism website describes the essential ingredients of professionalism as character, competence, civility and commitment. Those are most definitely inspiring words, but can you give us some real examples of what it looks like, so like when a member falls short of, of these expectations and these essential ingredients, because I feel like offenders may not even be aware that some of their behaviors violate these standards of conduct. Rebecca J. Bandy: Absolutely. Unfortunately, what we see most common are issues with emails. I actually reached out to our Bar Committees. We have two Bar Committees that the Center helps to coordinate and regulate and those are the Student Education and Admission to the Bar Committee and also the Standing Committee on Professionalism. And I asked them this question, what are you seeing most in practice in terms of unprofessional and civil behavior. And the resounding answer that I received back from them was we are seeing issues with emails. I had a judge specifically tell me that people aren’t thinking about what it means to send formal communications. And emails are so easy, people are just writing emails, they are using their smartphones to write emails. They are sending these emails out without thought and these emails later become part of the court record. And they are rude, sometimes there is foul language, they come across the wrong way and it’s discouraging. And so what he recommended specifically and wanted me to share with you guys is that before you send anything out, you should read through it. You should edit it. You should think through it from the perspective of the reader. Take a break, come back to it, and imagine if those same words were put in a formal writing, on firm stationery with a signature that you have written out by hand. And if the standard is not the same between the two forms of communication, then you don’t need to send it. And I think that is really, really good advice from Judge Barbara Pariente. I also had our former SCOP Chair Kara Berard Rockenbach, who is an award winner in professionalism down in West Palm Beach, and she said the same thing; emails, emails, emails. So we would like to urge people to be very conscious of what they are sending out, what their tone is, foul language should never be used, and understand that those emails, even though they are easier to send, they need to be sent with the same consideration as a more formal writing. Christine Bilbrey: That’s an excellent point, because more and more that’s probably the bulk of the communication that’s going on outside of the courtroom, and humor doesn’t translate well, sarcasm does not translate. Karla Eckardt: I think there are plenty of tools out there that attorneys can use, like they can snooze an email. They can save it as a draft. They can hit send later. So if you even have the slightest thought, and this is a suggestion from the Practice Resource Center, that it may not come off as polite, or if you are angry in that moment, it most definitely isn’t going to come off as polite, just save it as a draft and send it later. Rebecca J. Bandy: That’s correct. And unfortunately, I think we all know this, but we don’t take the time to actually do it, and that’s what we want to remind people of, and especially with law students coming out of law school, most of the law students are of a generation that this is their main form of communication, and so we just want to stress that you have to take time and reflect and understand how it’s going to come across on the other end. The same with social media, we see an increasing amount of social media issues, where people are posting things not in a private manner, but in a public manner that they don’t take the time to think about okay, how does this appear to everyone else? And it may not impact them immediately, but unfortunately that record trail is there and it comes back to haunt them. This was an issue with an election that occurred for an attorney who was running for judge and unfortunately social media posts that were made a number of years ago came back and were made public and became a pretty dark part of the campaign and that person was chastised pretty heavily in the local media and of course was not successful in the campaign. So we want people to just be cautious and careful and it’s just a matter of taking time and focusing on what’s going on. Karla Eckardt: If you wouldn’t want your mother to see it, maybe don’t post it. Rebecca J. Bandy: Yes, that’s not really done, exactly, if you don’t want your mom or grandmother. Christine Bilbrey: Or even your grandma. Rebecca J. Bandy: Yeah, I always say grandmother, yeah, you don’t post it, you don’t post it. It’s commonsense, but we are so busy and we are so distracted and we have so much going on, it’s really easy to forget, hey, I need to stop and do this differently. Christine Bilbrey: I have to tell you from inside the Bar, a lot of people didn’t know what the Center for Professionalism did, so I want to commend both of you, you have really raised the profile, you guys are everywhere now and I love it. I have seen you both do presentations. Rebecca J. Bandy: Thank you. Rebecca J. Bandy: That is such a compliment, thank you. Christine Bilbrey: Really. So I had seen the plaque on the wall, I didn’t know that if that was still a department before you got here, so good job. Rebecca J. Bandy: We hear that a lot, so thank you. Karla Eckardt: It’s exciting, it really is exciting. Christine Bilbrey: Because you are making it real. So I found on your website this awesome thing called the Guidelines for Professional Conduct that were originally put together by trial lawyers and the department pages that are on your website, I was surprised to find how specific these guidelines are for attorneys to follow. So if you are online, it’s like if you are in this situation, then there is a drop-down and it actually tells you, this is how you should proceed so that you are not being rude or you are not doing the wrong thing. There were examples. So when you are in the courtroom, when you are asking for extensions of time, how not to use this as like some sort of weapon against the other side, because you are probably going to anger the judge, communicating with an adversary, or having a party served, like if you are doing the timing of it. So I thought awesome, but I didn’t even know that was out there. So is this Guidelines for Professional Conduct, I saw that’s in the Professionalism Handbook, but how do law students or new attorneys get this? Adriannette Williams: That’s a great question and we actually have a handbook that we have created specifically for law school students, and what we find is that our boards who deal with discipline actually use that handbook when they are reviewing cases that come before them. And right now that handbook is in its final edit and it will be uploaded very soon, and this is a resource for our law school students and our new attorneys or any attorney that may have questions. And it lays out those main rules that you will see being broken or that kind of may have been a gray line in the past, a gray area in the past, and so those are areas that have been addressed in our handbook. So we have that as well for our law school students. Adriannette really has done a great job taking the lead in doing that over the last six months and so we have got a version online on our website, the Center for Professionalism’s website, but also we update it continually and we are excited that that’s now something that everybody can have access it. Karla Eckardt: Definitely and I think we can link to it on our own website, because it really is useful. I mean we get calls all the time like, what am I supposed to do when a client asks this or when a judge asks this and we usually just tell them well, be polite, I mean start with the basics. Christine Bilbrey: Yeah, the real examples are so helpful instead of saying be nice. Karla Eckardt: Right. So we look forward to using that as well. So the next question is really about remedial education. So does your department get involved when there are violations of professional conducts by members or is that all within the Bar’s Attorney/Consumer Assistance Program within Lawyer Reg and what do the Local Professionalism Panels do? Rebecca J. Bandy: Well, those are two separate things for the most part, so I will start with answering the Local Professionalism Panel end of it. So the Local Professionalism Panels came out of the Commission on Professionalism and Civility, which was headed by Justice Lewis, who recently retired from the Florida Supreme Court. He headed that Committee for around 10 years, so he did an amazing job. And the whole push for these Local Professionalism Panels were based on his urging, so to speak. And so what those are designed to be are an informal way to deal with professionalism issues that come out, that maybe don’t rise to the occasion of getting our Attorney/Consumer Assistance Program or ACAP involved. Maybe it’s an attorney that just is younger or maybe is new to the practice area, and so they are doing some things, being overly aggressive or overly rude, maybe not even realizing it. And so the Local Professionalism Panels can address that informally, for the most part it’s off the record, and they can deal with that person one-on-one in a situation where it’s within the community, so to speak, that that attorney is practicing in, and I think that’s really important. And again, what we hear from those Panels is that most of the issues arise when attorneys are overly stressed, where they are dealing with cases that are maybe over their heads a little bit, or if they have got personal issues going on, and their health and wellness is off balance and so they are letting that stress impact the way they are practicing. And oftentimes what we find is that when those Panels are involved, they address the issues and that’s it, said and done, and the issues are corrected. In terms of when attorneys have committed professionalism issues that do make it to the Bar, we work really closely with Lawyer Regulation and with ACAP, and they often will assign attorneys to Diversion Programs, and part of that Diversion Program is what Adriannette mentioned earlier, that’s our PPEP course, and it’s a four hour course and those attorneys come down or we travel to them. We hold them approximately four times a year and it’s just a really good refresher course on the basics of professionalism. But we take it a step further and we bring in emotional intelligence, we bring in health and wellness and we really delve into some of the soft skills that coming in they are really hesitant to hear about and by the end of the session it’s like okay, yeah. I think another important component of that Diversion course is that we always try to bring in a local judge to participate in a question and answer session as well. Here locally we have Judge Jonathan Sjostrom, who is a Circuit Judge in town and he is wonderful about volunteering his time to come in and speak to the attorneys about what he sees from day-to-day in the courtroom, what can be avoided, how to avoid it and it’s just very practical. And so we get really good feedback once participants leave that course. Christine Bilbrey: And Rebecca, you mentioned the issue of mental health, I mean that absolutely can have an effect on someone’s behavior when they have things going on in their personal life. And we also talk about the levels of stress are through the roof for attorneys, so we have got kind of this vicious cycle going on. And I am the Bar Staff for the Mental Health and Wellness Committee and then you have all the Professionalism Committees. Do you think that there are ways that the Bar could integrate the focus on the two issues that would be more beneficial to our members? What are some things you think that we could do to — it makes it more professional because we are addressing the mental health issues? Rebecca J. Bandy: Yeah, that’s a great question as well. That Committee that you are in charge of is just doing a fantastic job, and then YLD is doing an amazing job, also getting the message out with their new campaign, with the video vignettes that have been put online. It’s the #StigmaFreeYLD campaign for the hashtag. I try to support the YLD and what your Committee are doing by just getting information out there as much as I can through our social media pages, especially Twitter, but I think just awareness and the acceptance of, this is a problem, we know it’s a problem, let’s do better, and really getting that message out to law students as well and hopefully older attorneys or more seasoned attorneys shall I say as well so that they understand there is a better way of doing this. One of the areas that I am really focusing on is emotional intelligence. In an age where online forums and online programs are so easy to access, we really have to have the soft skills to attract clients, it’s so important. Emotional intelligence is our ability to understand our emotions, regulate our emotions and interact with other people. But even more than that, more than attracting clients, more than building our practice, being able to deal with our coworkers and with other attorneys, emotional intelligence is so essential to health and wellness, because it’s an essential part of being mindful and present and finding balance, and I think that’s what’s missing. And so if we can just educate, just continue to educate and hit that message over and over again in a way that’s tangible and meaningful and accessible, I think that is so important. I also want to touch a little bit on loneliness. There was a survey done last year and published by Harvard Business Review, and it was just heartbreaking. It pointed out that being a lawyer is the loneliest profession in America. And again, that ties to emotional intelligence and building authentic relationships. In July of 2018, Jeena Cho, who spoke last year at Annual Convention, she did an article following up on that research for the ABA calling loneliness the number one public health concern and I think it is astounding. There is an organization in the United Kingdom called the Campaign to End Loneliness. It’s phenomenal. The research that they have is just incredible. The statistics they have are alarming. And loneliness is a definite mental health and just overall health issue and it affects all people, and with that in mind, knowing that lawyers are the loneliest profession in America, that has some pretty severe consequences to it that we need to look at long-term. So it’s about connecting, it’s about finding mentors, it’s about being involved, asking for help when you need it and just having that support system. Karla Eckardt: So you briefly touched about sort of educating our members more and just pushing that message through as much as we possibly can, and one way in which we and other sections and departments do that is through CLEs, and we often get calls from members about fulfilling their professional responsibility requirements, and we usually just explain to them that five of their required hours must be in ethics, professionalism, bias elimination, substance abuse or mental illness awareness programs, but there is always some confusion between the umbrella category of professional responsibility and the specific CLE credit type professionalism. So what makes the CLE a professionalism CLE and do you think you can teach people this quality when professionalism is too often framed as a rule following or rule violation? Rebecca J. Bandy: We actually have had an update to the rule. So as of March, I believe it was March 15 specifically, but as of March of this year, everyone is required to take at least one credit hour in a professionalism specific course. And so everyone needs to know that, and that opens up the opportunity for us to really hit the definition of professionalism hard and also to make them understand what does professionalism entail. So currently if Bar members go to the In-Reach Network, for example, on the main page, once they log in to the Bar’s In-Reach Network, which is the on-demand course catalog, under the Professionalism headline, there are courses on mentoring. We have a phenomenal CLE that was done by Melanie Griffin in Tampa on the business case for mentoring, not just general what is mentoring, but what is mentoring, why is it important, why is it important to lawyers, and how do you network. I highly recommend that CLE. We also have one on emotional intelligence. We recently did a program at FSU about becoming very client-centered attorneys called “How to Become the Lawyer You’re Supposed to Be”, that’s in production. And so we are hoping to really ramp up our CLE production, increase our catalog there, so that as attorneys go in and try to find the credit hour, they will understand, okay, this is what professionalism means, mentoring, emotional intelligence, balanced lifestyle, how to communicate effectively, how to avoid problems with email correspondence and social media, all of those fun topics. Christine Bilbrey: That’s excellent information, thank you. Well, we have come to the end of our program and I want to say thank you to Rebecca Bandy and Adriannette Williams for joining us today. Adriannette Williams: Thank you for having us. Rebecca J. Bandy: Thank you. Thanks for having us. Christine Bilbrey: If our listeners have questions, how can they find you and the resources that you talked about today? Rebecca J. Bandy: Before we were using the Florida Bar’s social media; they do a phenomenal job, but we actually have our own Twitter page now. So if they go to Twitter and they search for the Center for Professionalism, we are there. We also have a hashtag that we use, it’s @FLBar and then Professionalism spelled out and there’s tons of information there. We are also on Facebook as well, so Center for Professionalism. So we are very active on social media and we try to get that information out. But they can also go to our website, we try to keep it as current as possible, and they certainly can reach out by email to me at [email protected] or to Adriannette at [email protected] as well. Christine Bilbrey: Perfect. Thank you. If you liked what you heard today, please rate us in Apple Podcasts. Join us next time for another episode of The Florida Bar Podcast brought to you by LegalFuel: The Practice Resource Center of The Florida Bar on Legal Talk Network. If you would like more information about today’s show, please visit legaltalknetwork.com. Subscribe via iTunes and RSS. Find The Florida Bar, The Florida Bar Practice Resource Institute and Legal Talk Network on Twitter, Facebook and LinkedIn, or download the free app from Legal Talk Network in Google Play and iTunes.